Sarah had her first couple volleyball games this past week. On Tuesday she played against Waukesha West. While they lost all three matches, I was so incredibly proud to see her out there in uniform I almost cried. She is so tall, that I think this is the perfect sport for her. She played in the first game (therefore, I can say she "started") and did OK. A couple of legitimate gaffes (foot faults, muffed serves, etc) but had some shining moments too. 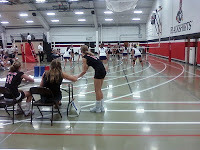 They lost the first game 25-15, second was 25-19 and the third was 15-12 (called on time). The two teams are cross-town rivals and don't like each other very much. The kicker was we had to stay and watch the Varsity play 2 of their 3 games after that. Of course, they didn't play RIGHT after Sarah's match either, there was a 30 minute difference. So, we did not get home until about 8:30. To follow it up, last night she had to play in a 5 team invitational at South. It started at 5:00 and did not get finished until 8:30. With cleanup, etc., Donna did not get home until 9:00. (I was at writing workshop). They went 3-5 on the night in matches for Sarah's team. I got to see her win her first game, so that was cool. She is clearly one of the top six players on the team at the moment. I really think that if she decided to apply herself to this sport, she could do quite well. I hope and pray she does, but we'll have to see how this year goes. Class last night was good too. We have a new woman, Stacy in it, though she didn't get a chance to read her stuff, so I'm not sure what she's writing. Looked like fiction to me.